I'm midway through my summer job with the U.S. Fish & Wildlife Service and I thought it would be appropriate to throw a quick catch up post together. Outside of my work schedule, I've made an effort to explore the area and see what it has to offer. 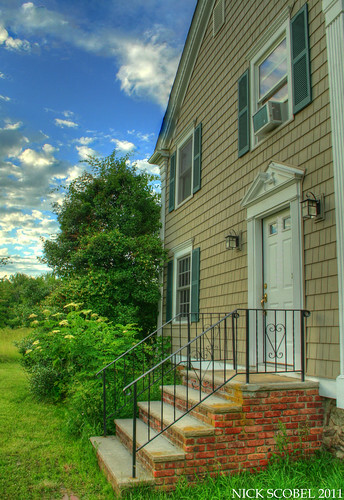 The surrounding area in this part of New Jersey can be characterized as foothills, with the mountains being an hour to the north. It's a beautiful place to be sure, as was this evening scene in front my my living quarters for the summer. One of the most astounding things about the area is the turtle diversity. With the exception of the two rare species I'm working with, turtles are extremely abundant in basically every habitat. We see turtles in fields, ponds, streams, and on roads. Here's a look at some of the most frequently encountered species I've seen within five miles of the house. 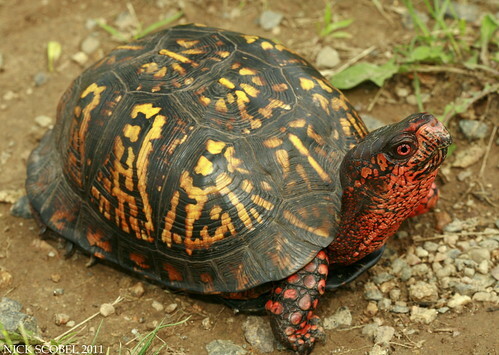 Spotted Turtles & Eastern Box Turtles are both listed by the NJDEP Division of Fish & Wildlife as species of special concern, but both seem to be faring well in the state. 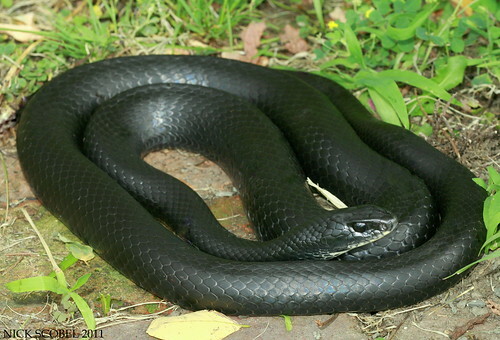 Though turtles seem to be fairly common in the area, snakes have been way less abundant. 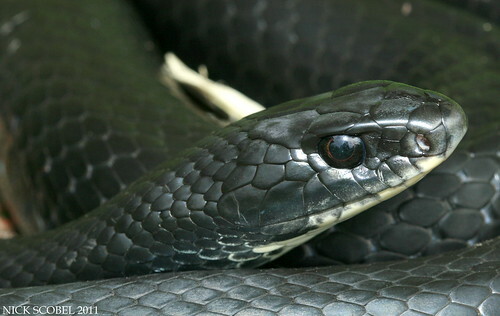 There are a few species that are fairly common, including our resident Northern Black Racer that we see frequently around the house. It's been a busy summer so far. 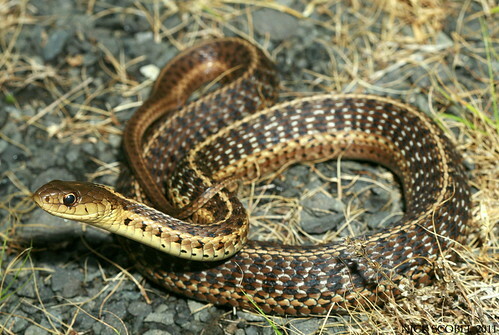 And I'm in the process of writing blogs on the herpetofauna on the Mountains of northern New Jersey and the Pine Barrens of southern New Jersey. Stay tuned for those, that's all for now. Until next time, happy herping! One of the rarest reptile & amphibian species in North America, the Bog Turtle receives both state & federal protection throughout its range. This summer, I've had the opportunity to work for the U.S. Fish & Wildlife Service on several conservation projects with rare & endangered turtle species including this species. 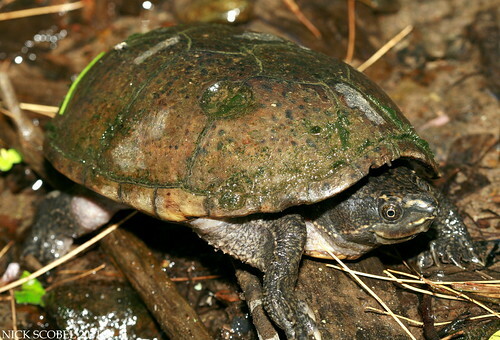 Bog Turtles are small, secretive turtles that easily rival and surpass Eastern Massasauga Rattlesnakes in terms of how cryptic & difficult to find they are. 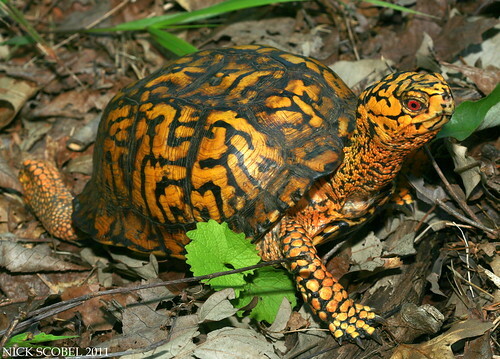 Their small size and bright orange markings on the neck make this turtle a highly coveted animal in the black market. 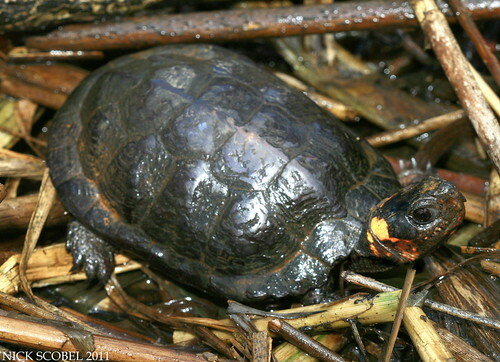 In fact, illegal collection is one of the greatest threats that the Bog Turtle faces in the future. Many collectors will pay top dollar for a wild caught individual, sometimes exceeding a thousand dollars or more. In addition to illegal collection, Bog Turtles face threats from the development and draining of the wetland habitats they inhabit. In fact, more than 80% of the populations that were known to have existed fifty years ago have been lost due to development. 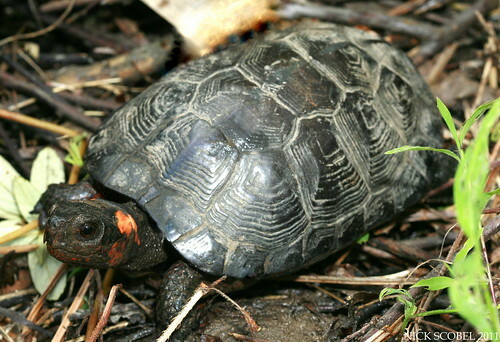 This warranted the Bog Turtle to be placed on the Endangered Species list as a Threatened species, where it receives full protection by the USFWS. It's not all bad news for the Bog Turtle though. Extant populations seem to be doing just fine and as long as their habitats are managed properly, they've got a fighting chance. Here in New Jersey, there are scattered populations throughout the state that are managed and protected by the USFWS and the New Jersey Department of Fish & Wildlife. Most of my work here involves radio telemetry with a population of Bog Turtles, as well as habitat restoration at both extant and historic populations to ensure suitable habitat remains for the species. It seems to be working, as several little gems like the animal below have been found. 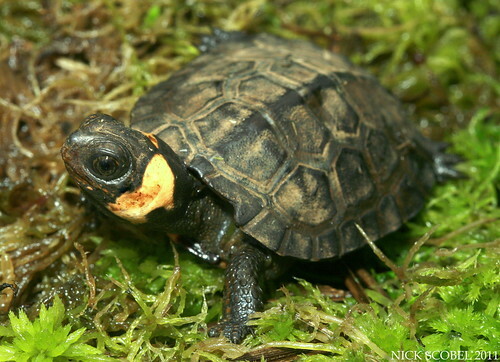 Cute is a suitable scientific term to describe a hatchling Bog Turtle, they are incredibly tiny. 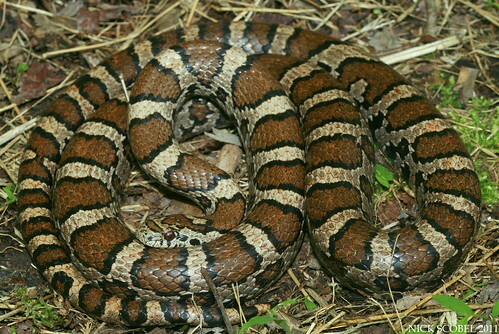 Females lay their clutch of eggs in early summer in sedge tussocks or in hummocks of sphagnum moss. The hatchlings emerge in August or September and must quickly try to find a hibernation site. 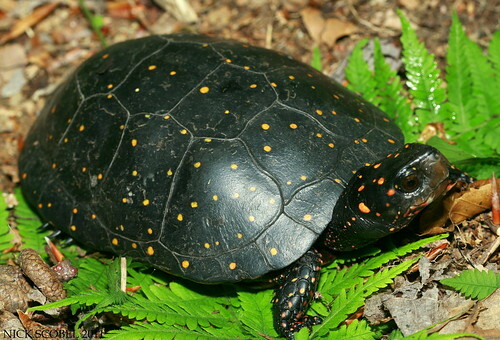 Bog Turtle nests probably face a lesser threat of predation than that of Wood Turtles of other turtle species because of the nature of their habitat. It's been great to have the opportunity to work with such an awesome species of turtle for the summer, I can only hope the remainder of the summer will be as enjoyable as the first half. That's all for now. 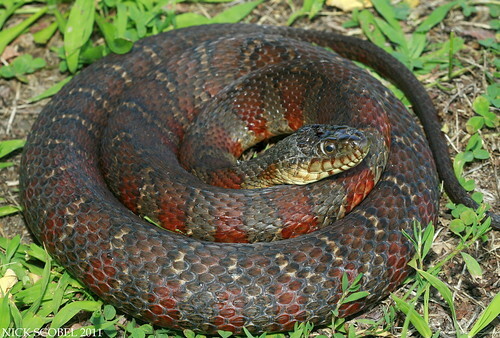 Until next time, happy herping!